Payap University’s Seal is the round-shape with the additional four circles at the center: The round symbols represent humanity, science, art and religion; the upper outer ring contains the words “ Payap University ” and the lower outer ring contains the words “ THRUTH – SERVICE “ which is the mission of Payap University. The Mesua Ferrea Linn Flower has pure white color which is the symbol of cleanliness, well-rounded being, equilibrium, integrity and goodness. The flower has fragrance which induces good feeling and content illustrating and spreading of profound reputation. The flower’s shape symbolizes the supreme honor representing splendid life’s value. 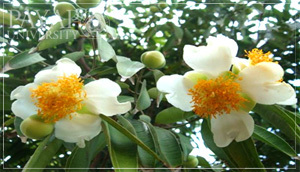 The Mesua Ferrea Linn Tree has botanical property in healing illness both physically and mentally that resonating the educated knowledge and truth of Payap University’s graduates can heal humanity’s illness and suffering. The Mesua Ferrea Linn Tree is the most difficult botany to grow: It requires delicate and splendid nurturing and care in order to grow and develop well which symbolizes great challenge and endeavor. Copyright © 2016 by Payap University Tel. +66 053 241255, +66 053 241482, +66 053 242697, Fax. +66 053 241983. All Rights Reserved.